July 2015: a real hottie! Once more no Black Forest, and again a trip to JO40XL/DA0FF. Maybe we should temporarily change the station label at the operators' workplaces? This time we knew a bit earlier about our fate; nevertheless the decision what to do wasn't easy. 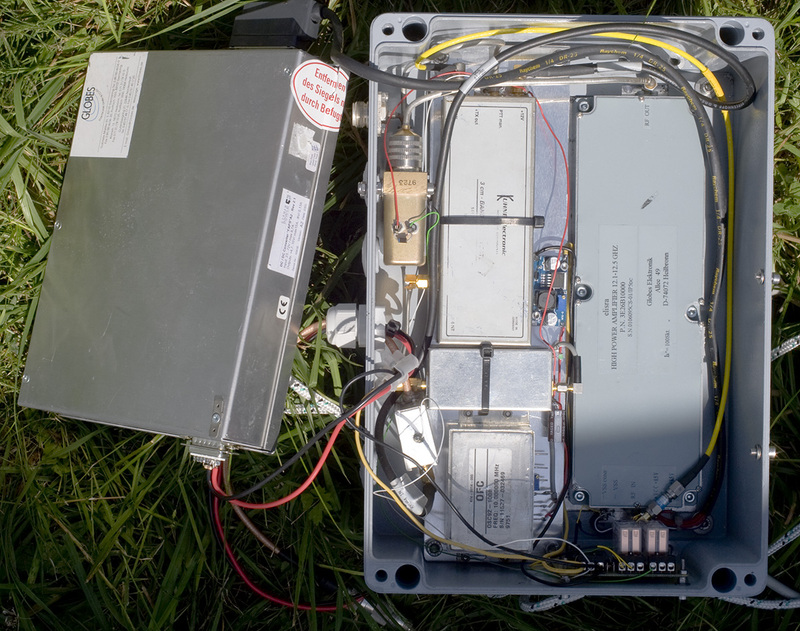 The DA0FF team wanted to test their own (first) 432 MHz setup, and successful 1296 MHz operation is not possible from this site as long as the local noise sources are not removed. 2320 without 1296 isn't attractive, either. So we had no more bands left for which we had tested competitive equipment. - Hmmm? We remembered the nice experience when our friends from Dresden had visited us in last October with their 10 GHz equipment. And we had already started to collect material since long ago, and even finished a feedhorn. - OK, a feedhorn with some flex waveguide, a TV offset dish out of the box, an unfinished elevation indicator, a 200 mW transverter, a half-finished PLVCXO and an unmodified 12 GHz PA is still far from a working station. But it was worth to accept the challenge. 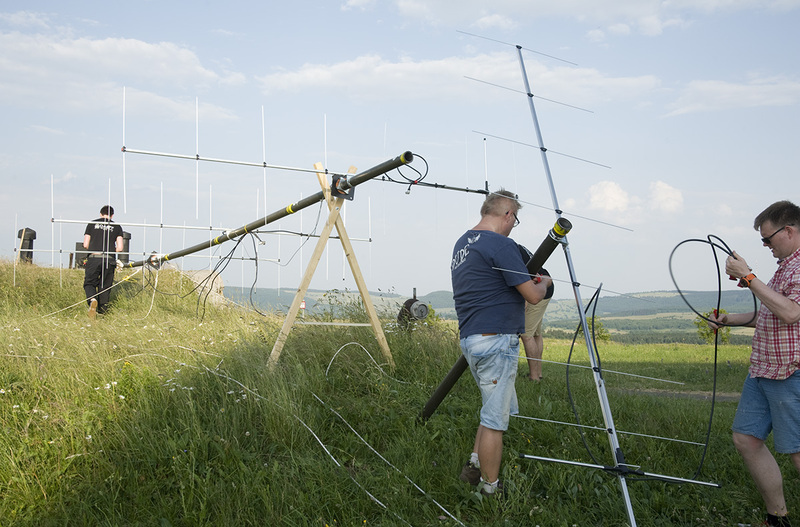 About two weeks before the contest we planned for 10 GHz. If it did not get ready in time it would be at least not a waste as we will need it in future for DR9A. 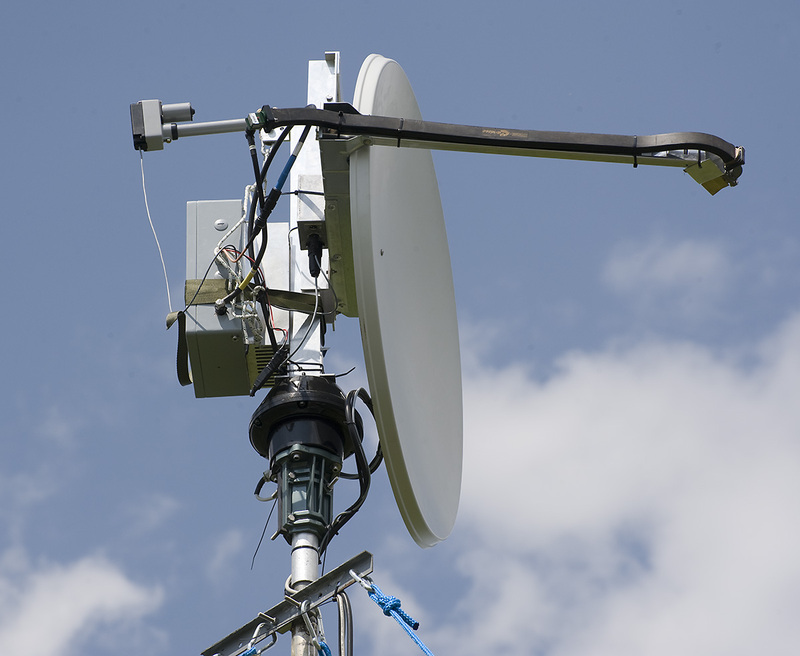 We built everything such that it should perfectly match the DR9A antenna setup. The team consisted only of Alex DL8AAU and Henning DF9IC. When we met the weekend before the contest in Friedrichshafen the purely mechanical part was nearly done, but the transverter box literally non-existent. BTW, it turned out that this is also mostly mechanical work. The Elisra PA was already opened, and Lorenz DL6NCI gave us last hints for the modification. Tuning-up the PA was fairly easy then, and we stopped at 16 W out with 10 mW drive level. There are all these little tasks which together need a lot of time - build a bias T for the IF/PTT, integrate a sequencer, a buck converter for 12 V, modify the transverter for external LO use, make semirigid cables for the microwave wiring, etc etc. The top cover of the TVTR box was closed on Friday afternoon. Then the trailer had to be loaded (and nothing forgotten). DF9IC started around 8:30 h pm instead of 3 pm as the plan was. 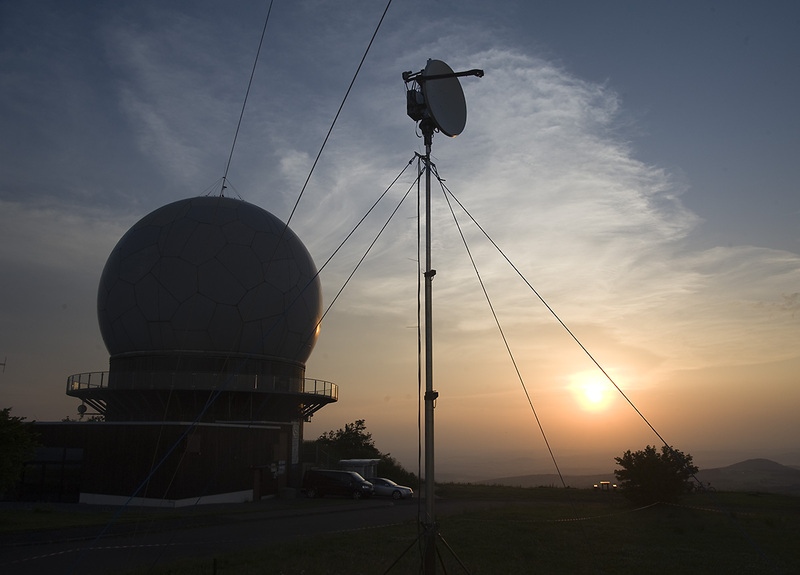 Picking up DL8AAU in Darmstadt, we finally arrived in the night around 1:30 am at 950 m asl. The last ascent always needs its time, with 1.5 to at the car's hook. We wanted to be fresh for the contest, so breakfast in the hotel was only 9 am, and the clock was approaching 10 am when we arrived on site. There was considerable work to do - not only to set up everything, but the broken EL actuator had to be replaced by a working one, and even the software for the gravitational elevation indicator still needed some fine tuning. But all the parts, from which some had been developed and realized separately by DL8AAU and DF9IC and met here the first time, worked together without causing new problems. Quite some effort has been put into the precise mechanical control of AZ and EL which, together with a precise frequency, considerably increases the fun factor during operation (and the success, too). We calibrated the mast to +/-0.5° deviation from the vertical direction. A theoretical 2,5° 3-dB antenna beamwidth from the 1 m offset dish is not much! - All this needed time, and we did not want to hurry but try to gain experience for future improvements. We were ready about 1 h after the start of the contest. Finally, this is not 144 MHz, so why care? During the week before the temperature had been rising from day to day. Blue sky, sometimes not a single cloud visible. At our arrival on Friday night it had been 25°C at 950 m asl, long after midnight! - On Sunday the all-time temperature record in Germany was measured with 40.3°C in Bavaria. And this Saturday was also hot, with over 30°C on the mountain; only the wind helped us to work at these conditions. In other contests antennas and PAs are the crucial part of the station, this time it was the fridges (we had 2 working, 1 broken). But the contest developed into a "hottie" also in the other sense, at least at 10 GHz. It started with rain scatter, continued with new scatters here and there, and ended with a tremendous scatter front in the east and northeast of us. When we stopped operation on Saturday after midnight there was still scatter - and when Alex returned the next morning the game continued. 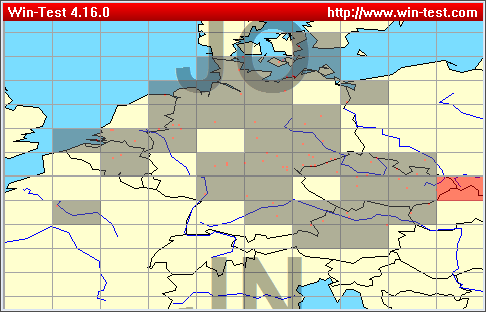 Some CW signals were very loud, and we even had some SSB DX contacts, e. g. F6DKW (JN18) via rain scatter, DC6UW (JO44) via tropo (?) and PA0S (JO22) via airplane. There were also impressively looking clouds around us. So even with us completely unexperienced operators the QSO number was rising - 44 QSOs until Saturday night, and 80 in the end. This was way more than we had dreamed of! 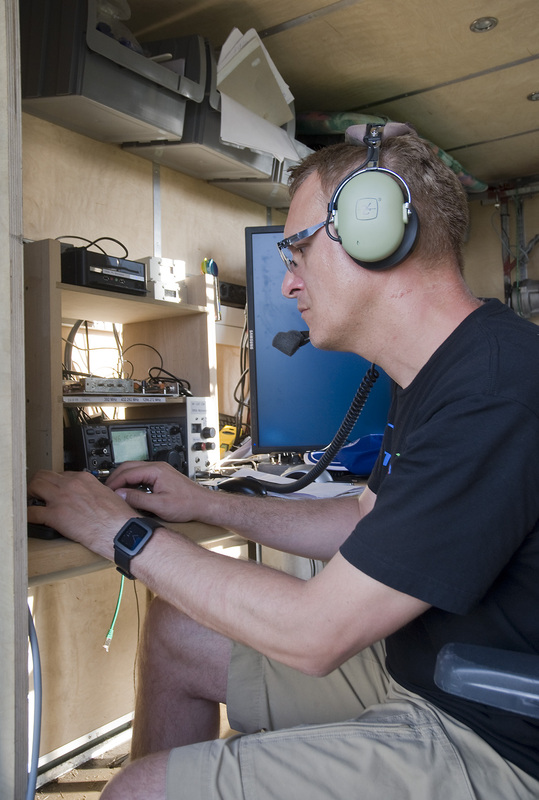 - Alex DL8AAU had to work hard, with moral support from DF9IC and DL4XX, and made QSOs via rain scatter, tropo and even airplane reflection. During Sunday morning, Henning DF9IC installed the 24G/47G/76G BBT station on the highest accessible point, and we made a few local skeds. With DL0GTH (62 km) we could work on all three bands. We missed DH6FAE on the Vogelsberg, otherwise we might even have had a second QSO on 76G. 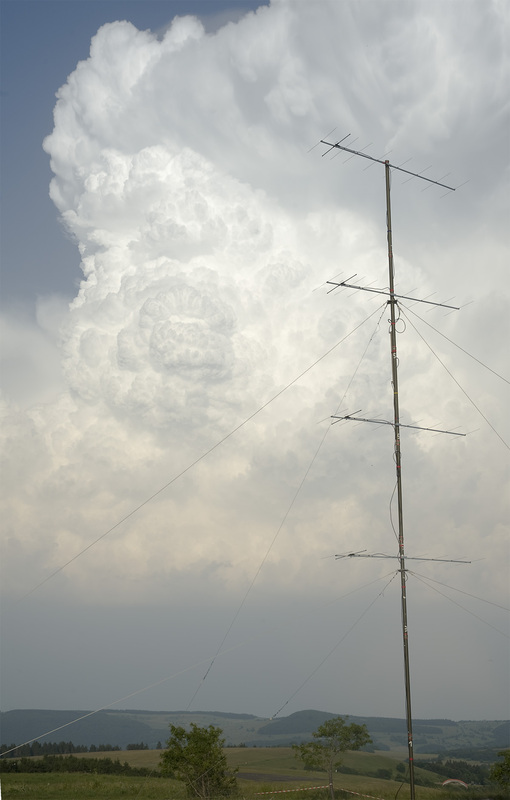 The weather remained stable - we had seen flashes from high thunderstorms during the night - until the end of the contest and beyond. 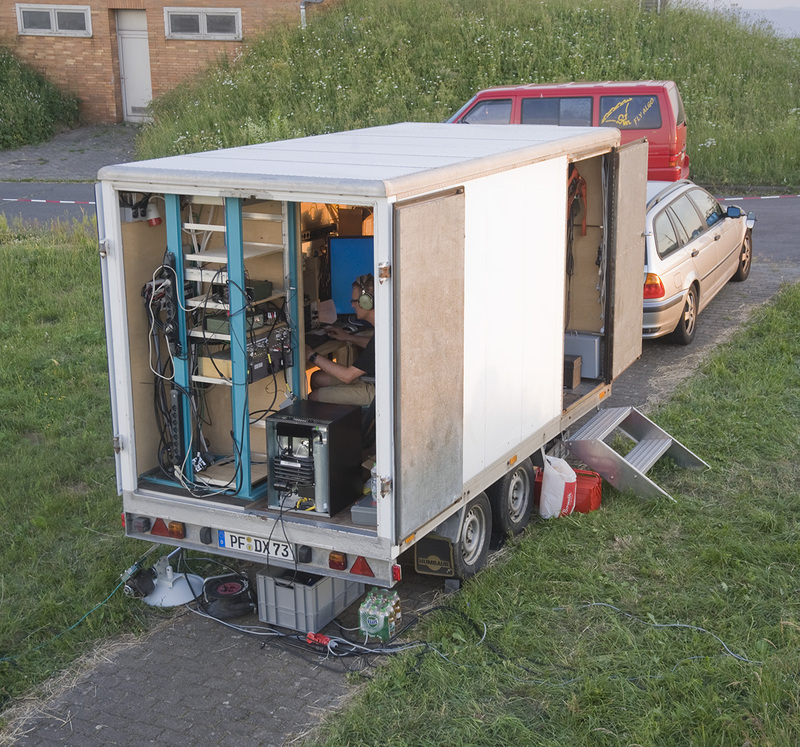 After the 10G station was removed and the trailer packed we helped the friends from DA0FF to take down their 2 m and 70 cm antennas. We left around 7:30 pm, and DF9IC was back home just before midnight. It was a very successfull event, from our view, even though DL0GTH is 21 QSOs and about 4k points ahead. 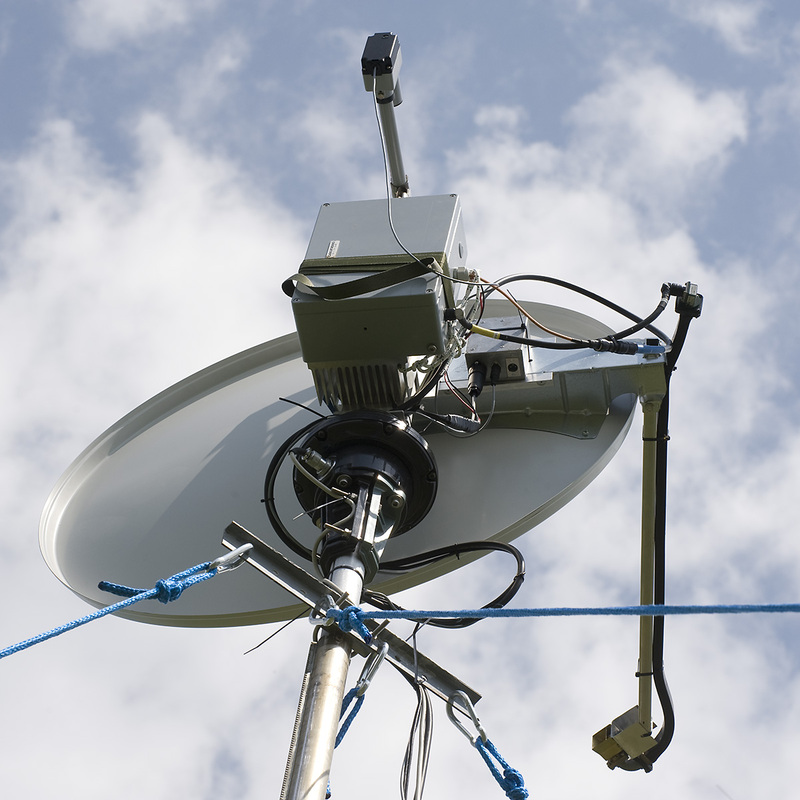 But they have more than 15 years of experience at 10 GHz, and for us it was the first contest. 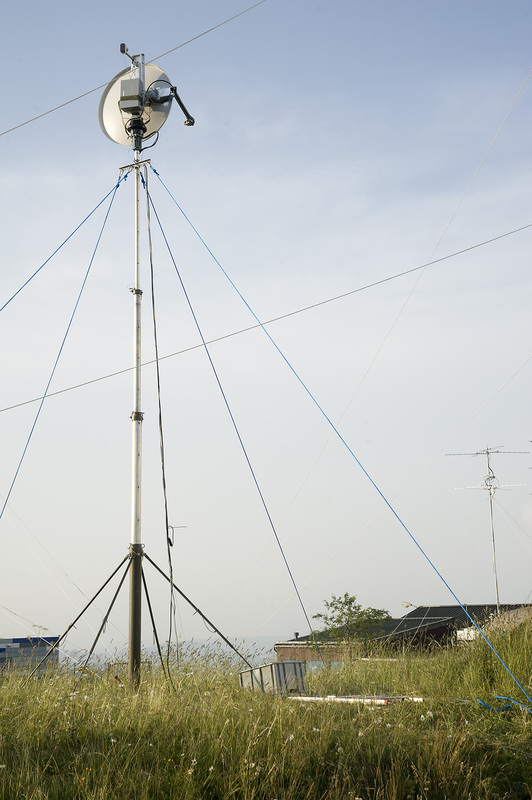 Thanks to the DARC, section A35, for the lease of the mast. From left to right: DF9IC, DL2ZXA, DL8AAU, The Fridge, DL6FBL, DK5OH, DL4XX. A small team, for 6 bands.